Da gleichzeitig gerade Eric M. Lang als Chef-GD vorgegestellt wurde, hoffe ich mal, dass er was damit zu tun hat. Ich bin gespannt, in dem Setting steckt viel Potenzial. Erstmal die Häuser von Westeros an sich, Wildinge, White Walker, und Essos mit den Reitervölkern, Sklavenhändlern, etc. UND die Drachen nicht zu vergessen. Spannend finde ich, dass sowohl FFG als auch CMON auf den Bereich zwischen Miniaturen- und Brettspieler abzielen. FFG hat den Vorteil, dass die Schablonen wohl für viele einsteigerfreundlich erscheinen, CMON hat one-piece Figuren, die man bloß in die Trays stecken kann. Unfassbar, ging hier an mir vorbei. In addition to these familiar elements, A Song of Ice & Fire is also bringing in some really unique aspects of the universe. Some well known characters, such as Cersei Lannister, are not active on the battlefield but can be added to the sidelines of your army. These characters interact with what is called “The Intrigue System” and will provide abilities that represent the machinations and political intrigue that makes up so much of Westeros. 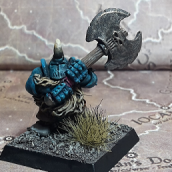 There will be thematic, open and generated scenarios, giving you the freedom to recreate a battle from the books, generate your own in what CMON is calling a “fan-fic generator” or simply throw your models onto the table and play. Wow. Da werde ich mir wohl doch mal ne Kreditkarte zulegen müssen. Aus dem Szenario kann man auf jedenfall ne Menge schöner Minis rausholen. "Hey everyone. 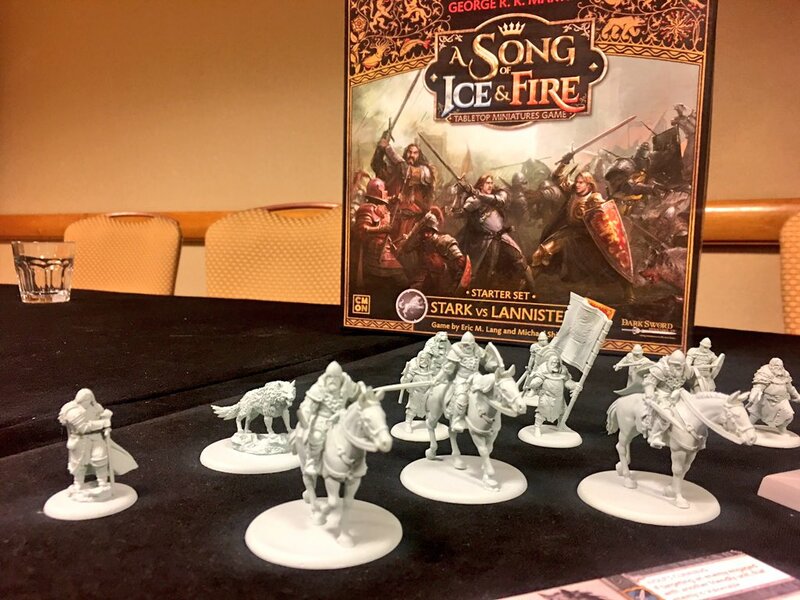 We’re here at CMON Expo 2017 at the A Song of Ice and Fire panel. 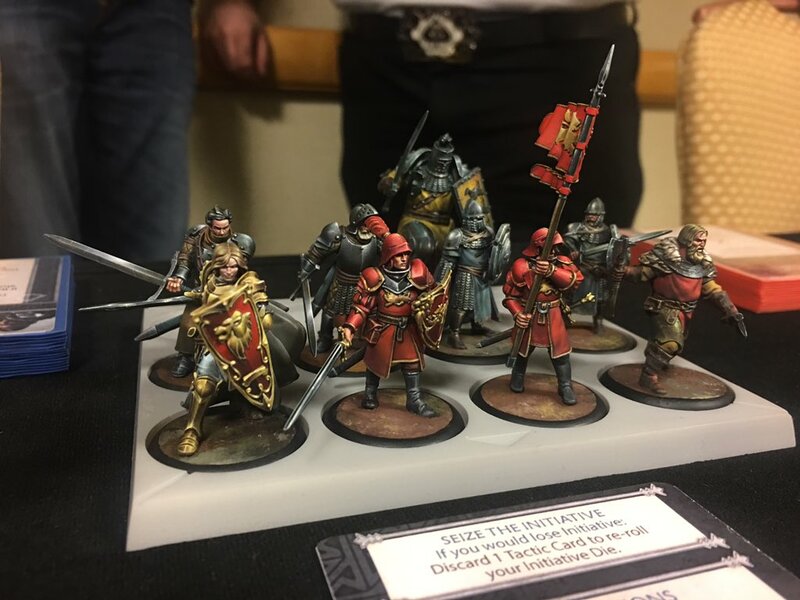 This is the first real chance people are getting to hear about the upcoming miniatures game from designers Michael Shinall and Eric M. Lang. On the panel, we have Eric, Michael, and Guille (producer for the project). This is a Q & A fashion event, so I’ll be getting you as many of the questions and answers as possible. Guile: This is our first chance we’re bringing the product to the public. 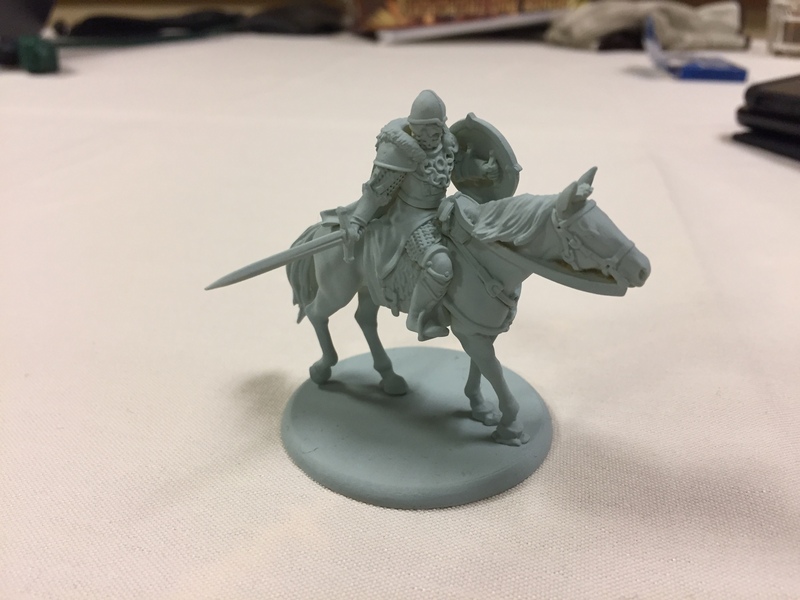 The miniatures that you will be able to see are resins, but are very close to what the final versions will be. What we have on display isn’t quite everything that will be in the box (meaning there will be more than what you see). We wanted the sense of a mass-scale game, but have the feeling of a smaller game. So the rules are quick and streamlined, giving you blocks of figures. The factions are all very different from one-another. Michael: When we started this over 2 years ago, we were having to deal with factions that were different but were still two guys versus more guys. We talked with George R. R. Martin to make sure things were very different. The Lanniseters have a regimental, almost Roman look to them. The Stark units are big and burly and are wearing bears. Even though almost everything in the setting is a human, we wanted a very different look for the factions, as well as how they play. Lannisters have better gear, but the Starks are much more loyal and will fight harder, even as they get whittled down. 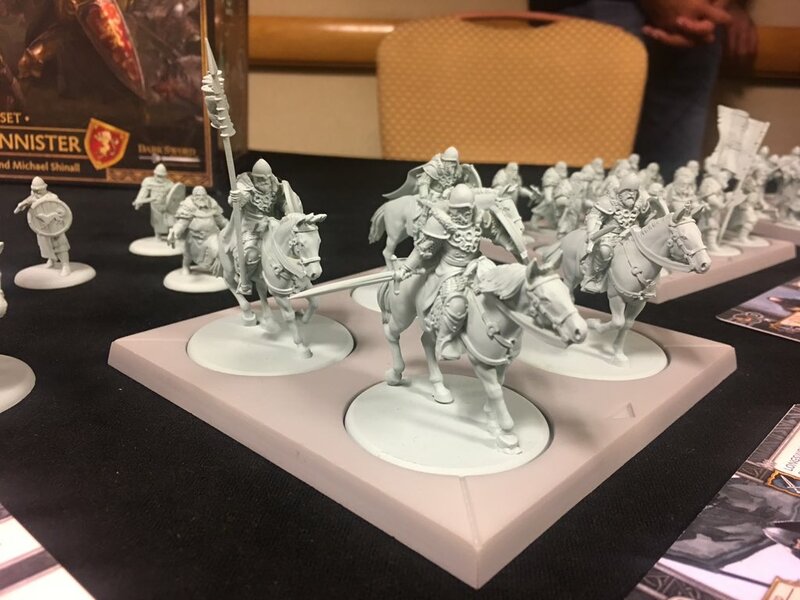 Guile: We’re partnering with Dark Sword Miniatures. Everything is going through George. We have license for anything that is in the books. There’s a great diversity in houses. Question: Since you’re in contact with George, have you screamed at him about his next book? Guile: We wanted to make sure that the core box, on its own, is a great product. It is designed with lots of customization just in the box. For example, your choice of commander augments your Tactics Deck. Michael: Each army has a Tactics deck that’s determined by your faction as well as your faction. You could play the exact same units, but with a different commander, and your army will play very differently. So, say, The Mountain will make it straightforward and charging. While Jamie might be more tactical. Eric: Everything you need is right there. There’s not a lot of “hidden rules” that you have to go and look for. Guile: For example, about 1/3 of the deck will be affected by the commander. You can also trade out regular troopers for non-character heroes that will also change the armies. Non-combat heroes like Cersie, will go onto a Tactics Board. They still have an effect on the game. 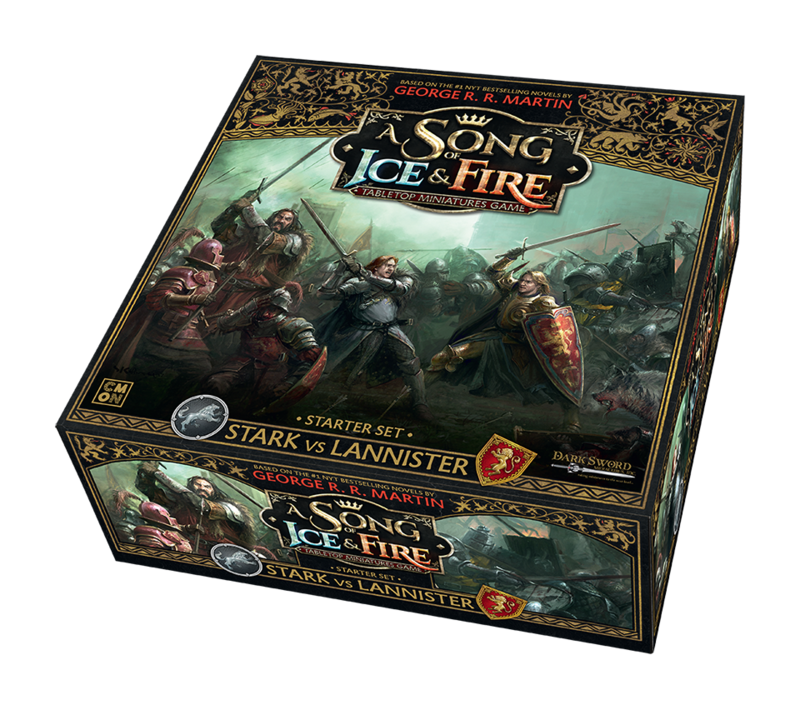 Michael: If you add Cersie in your army, you can benefit from the different Tactics on the board and change the course of the battle via Intrigue and such. But, overall, this is not a high-fantasy setting. Adding characters to units won’t just bump-up armies. They will, instead, change the tactics of how a unit plays. The characters, in general, aren’t going to have a higher kill-count than your average trooper, but will instead change how units play. Eric: Tactics cards work with the Tactics board. If a character occupies a space on the Tactics Board (and you can only have 1 character in each slot), it will “unlock” better abilities on the Tactics Cards. Guile: The models will be pre-assembled in colored plastic. Each faction has their own color associated with it. Michael: One note, the pieces are pre-assembled, but not one piece. Modelers have asked us about that. Guile: The game is based on a points system. So it scales up and down easily. The rules don’t change at all depending on your army size. Guile: So why have the minis? A unit’s power is based on the ranks in a tray. An entire row is a rank. Once a unit is depleted of its ranks, the number of attack dice changes. Most of the time it goes down. Also, as a unit will make Resolve checks, they will lose more models, and it will get harder to pass the tests as they lose minis. Michael: It’s very easy to track the abilities of a unit by simply looking at the number of ranks left in a unit. Eric: It’s not all about how hard you can hit. It can very much be about how you can out-morale your enemy. Michael: For example. Lannisters have low morale since they’re just paid soldiers. While the Starks are fighting for a cause, so they will stick around longer. Question: Where is the game set in the timeline? Michael: King Baratheon has died. That’s it. From there, you can play as you want, sort of making a “fan-fiction generator,” letting you decide how things have gone. 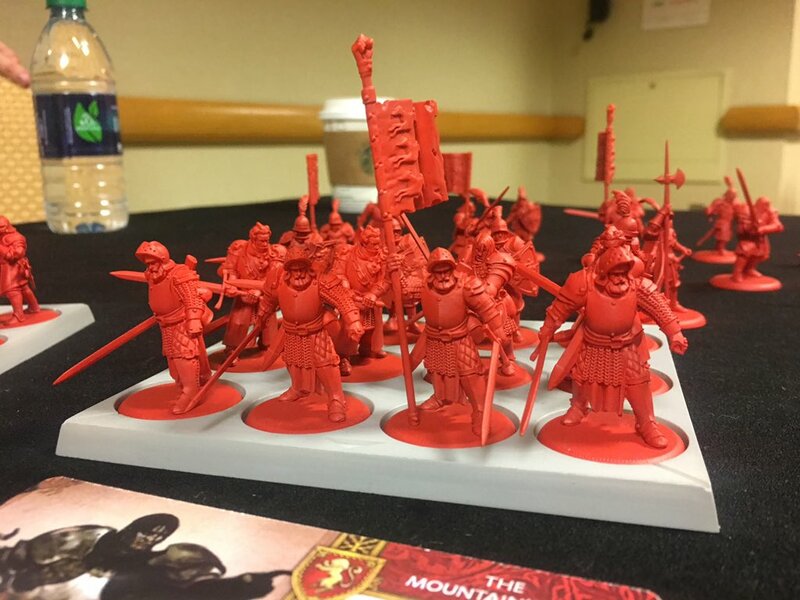 We will have 2 modes of play that you can just play as you want, but we will also have scenarios that will let you recreate famous battles from the books. Eric: This is a full wargame, by the way. Question: What size is the board? Question: What dice system does it have? Michael: It is a D6 system. Question: How does terrain affect movement? Michael: We have not skimped on terrain rules for the game, as it is very important for games like this. They use a keyword system so you fill out the board with pieces and assign them keywords so you know how they will affect models as they move across it. Question: Most games are 1-vs-1. Will there be rules for 3, 4, 5 player games? Michael: Oh, absolutely. Even in a large game, with alternating activations, it’s always at least almost your turn. Plus, with the Tactics cards, you will still have things you can do, even on your opponent’s turns. Eric: Pacing and timing is everything. We thought a lot about that. With the Tactics board, it’s very important when you activate things. Question: Is there a phase for the Tactics cards? Michael: No. There are triggers that will activate tactics cards from your hand. Question: The starter will be Starks vs. Lannisters. Will there be other boxes later? Guile: There will be. This is not just a 2-faction game. There will be other factions in time. Question: Have you really been able to create your own units and such within the setting? Michael: Oh, certainly. The Lannisters are much more “regimental.” But the Stark guys will have Tulleys and Umbers and such, and will have a more “ragtag,” but not in a bad way. But they will have a rather wide look to the force. Question: Is this an all-melee game? Michael: There are ranged units in the game, and they will be strong, but most are move-or-shoot types of units. So you will have to think hard about where your units end up like that. Guile: And ranges aren’t very long in the game. Many max out at about 12”. Eric: We didn’t want the game to be feeling like units just trading fire far away. Question: How does combat work in the game? Michael: Hey Eric? Wanna fight it out? Trays of units have lines of sight notches on them. Models have line of sight. You will get bonuses for attacking models in the flank or the back. Units, when they move, can pivot in place before moving (and occasionally afterward). A unit’s movement is right on the card, letting you know, in inches, how far you can move. Pre-measure is fully allowed in the game. When a unit charges, it has its base movement, plus d6”. If you make it, great. If not, you move forward and stop at the end of your movement. When units make contact, you square up. A unit can make a charge attack after it moves. Units have a stat line that tells you how many dice they get to roll based on how many ranks they have left. They will say what a model will hit on. So, for example, a unit might get 6 dice and hit on 4+, or such. A unit will get extra hits when they charge, as well as attacking from the side or back. When you hit, your opponent will make an armor save based on the value of their defense. There are potentially attacks that will change what that defensive roll will be. So, for example, if a unit charges from the side to a unit and rolls 4 hits, their opponent would need to make 8 saves. Tactics cards can also change various effects in this. After the defensive roll, a unit will lose models equal to the number of failed saves. This may reduce a unit down in rank size. Whenever a unit loses a model, they will make a resolve test. Each unit has a resolve value. You must roll 2d6 and roll equal to or higher than your resolve value. If you pass, nothing happens. If you fail, the unit will lose the rest of its last rank. This can potentially make a unit run off entirely (if there’s only one rank left in the unit). Question: Will there be dragons? Will there be organized play? Guile: As for the 2nd question, we are fully planning on having support for organized play on Day 1. Question: How will you deal with magic? Michael: Well, it’s a low magic setting, but I can guarantee it’ll show up in your Tactics Deck. Eric: The Tactics deck allows a lot of customization like that. That will mean you won’t always have access to all your abilities, but you can still have it made to what your army wants to be like. We wanted some drama and uncertainty, and that’s what the deck brings. Question: Are you planning on play mats and such? Question: Since characters in the series die often, will there be “eras” to the game as the story progresses? Michael: No. There will never be a point where, “you can’t use that model anymore.” But there will be different versions of the named characters, based on how they’ve grown and changed over the course of the narrative. 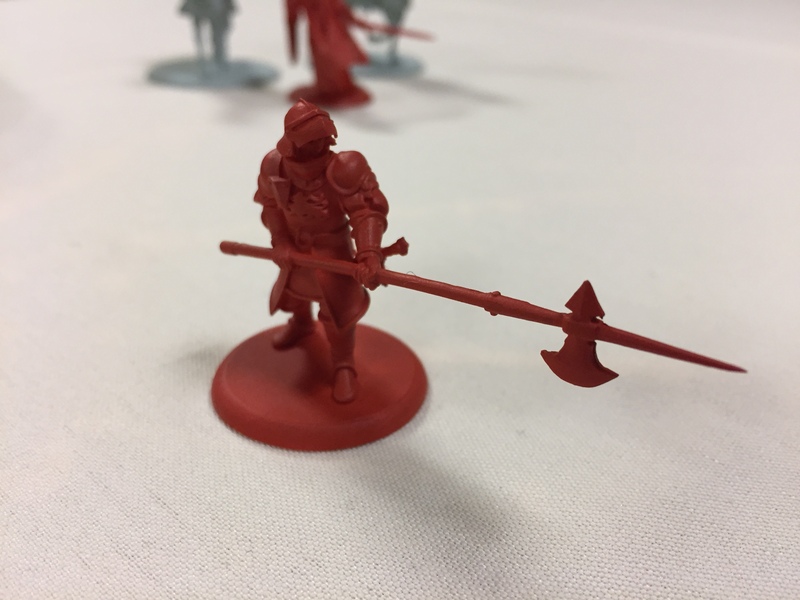 Question: Will you focus on big box armies or more like smaller-box mercenaries? Guile: A little of both. There will be the big army boxes and the starters, but there will be smaller size unit-sized boxes, or a box that’s a set of characters. 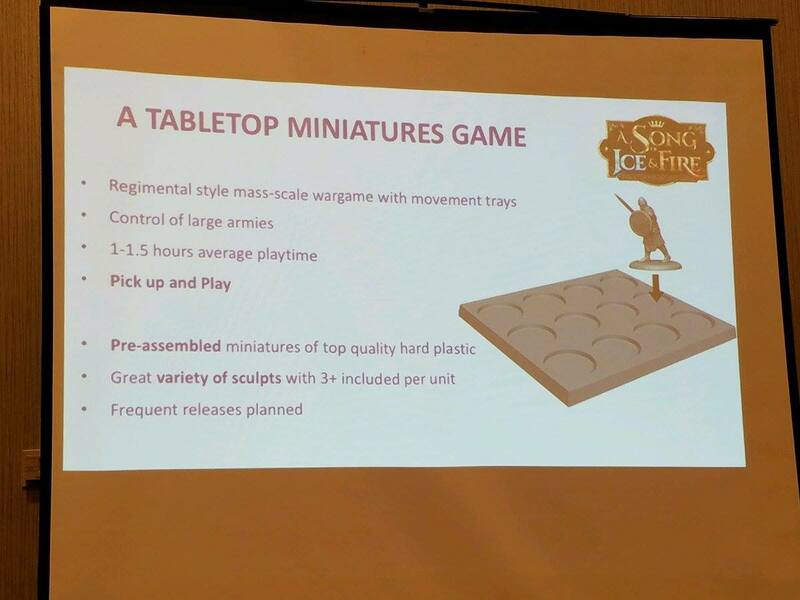 Question: What is a “standard-sized” army? Michael: About 5-7 units per side. With a game taking about 60-90min. Question: How about movement? Do you have to worry about spinning inches? Michael: Models are able to pivot in place during part of their movement actions. No worries about having to remember so many inches pivoting. Question: How did the game come about? 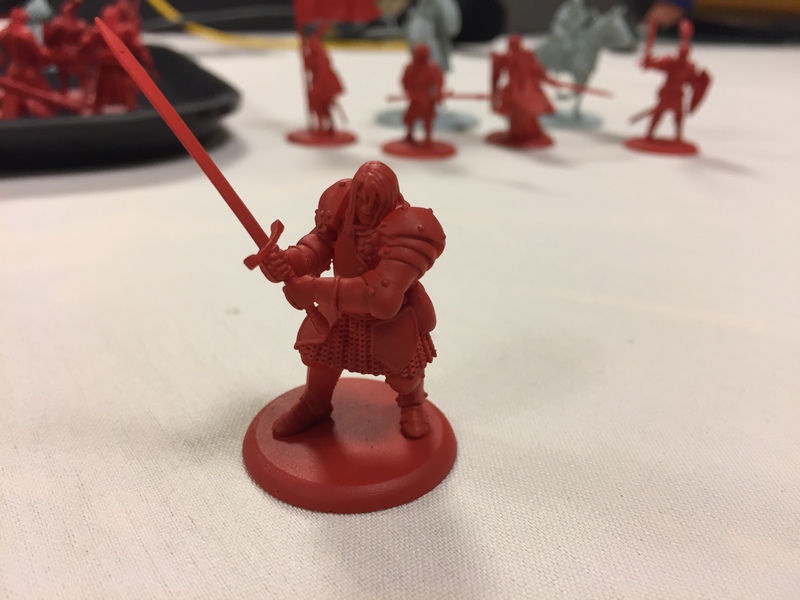 Michael: The higher-ups at CMON talked with Jim Ludwig at Dark Sword and, well, they just kinda came together and now we have the game. Question: What about win conditions in the game? Question: Campaign rules? Will there be some? Question: What about objectives during the game? Michael: Still also something that’s in development. Eric: There’s so much depth and texture we can add, particularly with the Tactics deck, that we can be bringing into the game. Question: Are the units always 12 models in size? Michael: Units can potentially link together, depending on the different units. They have specific abilities that will tell you how they work. Question: So when buying units, it’s a standard size? Question: What are the final models being made of? 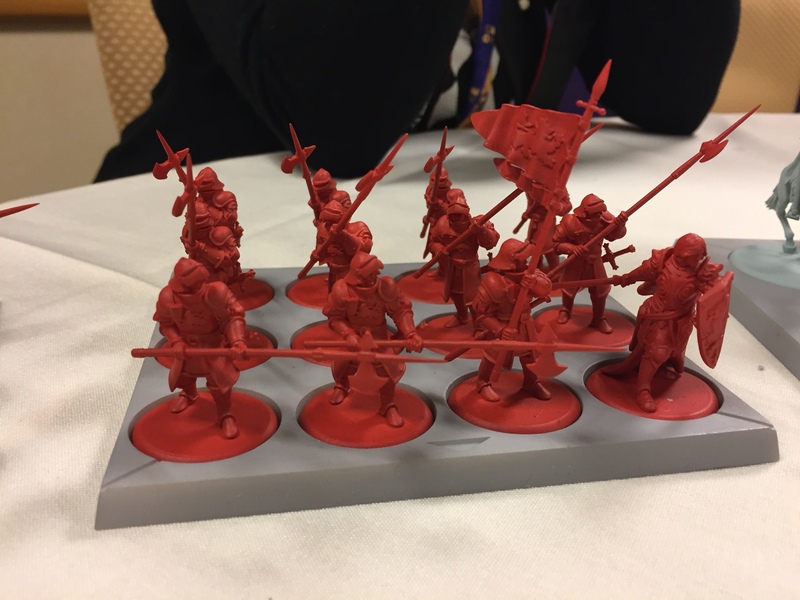 Michael: The miniatures are going to be in plastic, with spears and such are going to be a slightly harder plastic material, so you don’t have bendy-spears and such. Question: When is the Kickstarter? Da hat sich der Kneter aber nur grob am Bild orientiert. Omg - ich bin gehyped.